I would like to note that the Libyan people were not in any way extremist Muslims. The part of the Koran that was added by the Ayatollah Khomeini talking about killing infidels was thrown out of Libya by Ghadafi because he said it was not part of the Koran. For this there was a fatwa or death order put on Ghadafi for over 20 years by the radical extremist Muslims. All religions with a book were allowed in Libya. Women were emancipated in the 1970s by Ghadafi. No special clothing were required and all women were highly educated if they choose to be. They were doctors, lawyers, ministers, business owners, or just house wives whatever they decided. Libya shared ½ of all the its oil revenue with its 5.5 million population. All medical care was free, if you could not get the care you needed in Libya then you could travel wherever you needed with a family member and all costs and expenses were fully paid. Education was free and if you wanted to go outside to another University that was paid in full with a stipend. When a Libyan couple got married they received a $46,000 gift from the government to start their lives. Their first home, a 2,500 sq foot condominium cost 10% of their salary for 20 years and then it was theirs. Gasoline was 44 cents a gallon, all utilities were free. If you were hungry and had no money they had huge stores of food where you could get rice, milk, cheese, flour and money to buy meat. The average salary in Libya was the highest in Africa, higher than China or India at $15,800 a year. If you had a college education and could not find a job you received that money until you found a job. The Libyan people were happy, there was no tax, only businesses had some tax but it was minimal. The government shared the wealth of Libya with its people, there was no taxing of the people to support the state. 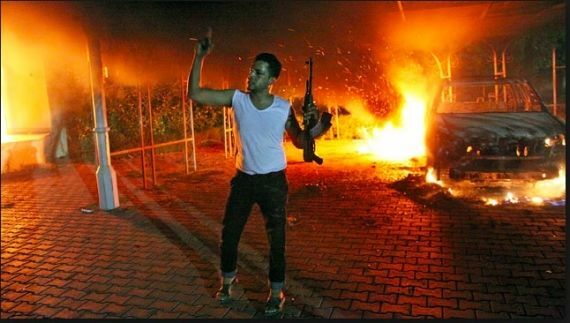 There was no reason for a revolution, there were some disgruntled radical Islamists who had tried to enforce Sharia law and radical Islam upon Libya to no avail because they only made up about 3 to 5%. These are the people NATO and the US joined hands with to take over Libya. In April of 2011 we were invited to travel to Tripoli on an NGO Fact Finding Commission. We agreed and in May of 2011 we traveled to Tripoli, Libya to take part in this Fact Finding Commission. We spent a whole lot of time with the Tribes of Libya learning about the truths of Libya and their government. We also were witness to huge war crimes committed by NATO upon the innocent people of Libya. Because there was no popular support for this so called revolution in Libya, it was necessary for NATO, the US, UK, France, UN, Qatar and Israel to funnel in thousands of Al Qaeda mercenaries into Libya. We are witnesses to the hordes of terrorists, that were armed, funded and trained by the aforementioned group. We have in our hands the private document written in Hebrew that is an agreement between the would-be rebels and the Mossad. The agreement states that Israel will provide arms and training to the rebels until they take over the country and, in return for that, Israel will get to put a military base in the green mountain area of Libya. 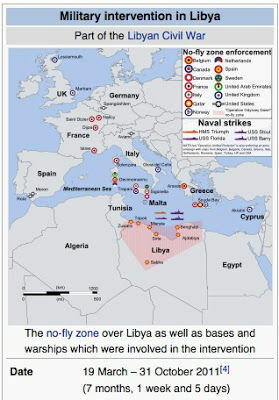 The war against Libya had been planned for a long time. Dennis Kucinich held the documents that showed that there were war games in the Mediterranean with the French, UK and US against a mythical North Africa oil rich dictator nation. This was supposed to start on the 21st of February. The war actually started on the 17th of February. The main reason for the destruction of Libya was the gold-backed currency for the continent of Africa called the Dinar. Ghadafi had planned the African bank and, with the formation of this bank, Libya was leading Africa to freedom: Freedom from the paper bankers, the imperialists that controlled the poor countries and their assets. This gold backed currency would have destroyed the paper bankers whose money is backed by nothing. Those paper bankers, the FED and the EURO owned by the Rothschild group, would have been destroyed. 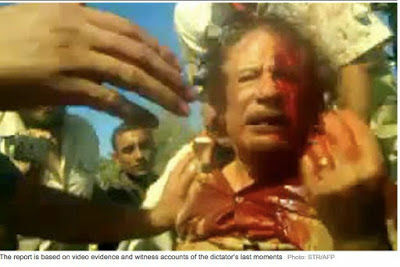 For this reason Ghadafi had to not only fall from power but he had to die. If he had gone into exile, his mouth would still work. The second reason for the Libyan war was AFRICOM, the US military control of Africa. Libya was the strongest country in Africa, and Libya refused to ever let the US take military control over them. The third reason was the lawsuit that had been filed by Ghaddafi (Libya) against all the Western European nations for all the broken treaties and all the atrocities committed in Africa over hundreds of years by the Western Europeans and the loss of revenue caused by the embargo against Libya for 30+ years. It should be noted that Libya was not guilty of the Lockerbie bombing, as proven by a CIA whistle blower. This law suit was for $7 + trillion dollars, and it had legs. Western Europe could ill afford this kind of debt so they happily joined in the destruction of the sovereign nation of Libya. On the 21st of August, NATO decided that they had waited long enough for the Libyan people to get behind their coup d'état, so they forcibly took Tripoli. We were at a big hotel near the seaport. We saw NATO bring in their Apache helicopters and mow down the innocent people in the streets. In the first hour of NATO's takeover of Tripoli 1,300 people were killed in the streets and 5,000 wounded. NATO also ran bombing raids and used big guns mounted on small pick-up trucks. 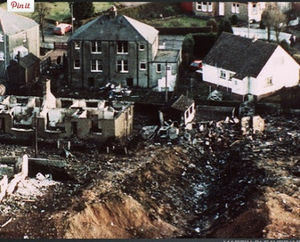 The bombing and killing went on all night and for the next three nights. Next, shiploads of Al Qaeda rebels flowed into the Tripoli port from Benghazi and unloaded on the roads around Tripoli. All of the people were bearded and carried AK-47s. As they rode around Tripoli in their caravans, they began to set up check points every 500 yards or so. They looted every store and every home they could get into. They broke into every vehicle and stole everything that they wanted. They took over hotels and set up torture centers. The Russian ambassador had called and offered to put our name on a list on a rescue ship that was being sent from the Prime Minister of Malta. We were approached by a couple other Westerners and asked how we planned to get out of Libya. We said we were trying to get on the rescue ship sent by Malta; they asked if they could join us, and we said we would ask that their names be put on the list. The FIFA soccer coach for Libya from Germany joined us, the sister of the President of Mauritania, a Baharani Prince, a man from Texas who we did not know before, and a Filipino lady who had been working at the hotel. We arranged ourselves on the van from the hotel and left in the late afternoon to meet the ship that was supposed to be arriving in one of the ports along the Tripoli coast. We were stopped at every check point by bearded Al Qaeda firing their AK-47s into the air and yelling Allah Akbar. Our driver told them in Arabic that we were journalists, and they let us through because the media had been lying about the rebels so they were happy to let us through. We could not find the ship, and after some hours of up and down the coast, it was now dark. Guns were being fired everywhere. Al Qaeda bearded types roamed the streets. We did not know it, but the rebels had fired on the ship and it was three miles out in the Mediterranean. Our last trip to the pier was our downfall. We were suddenly surrounded by a group of small pick-up trucks, and out climbed a bunch of Al Qaeda with their guns pointed at us, and they said, "Your game is up". They took us at gunpoint to their torture center, which had been the Radisson Hotel. They took all of our belongings and our passports. They interrogated us and filmed it using a British film crew. We could hear the men being tortured but we could do nothing. Finally, after many hours (it was now daylight), they said we were going to be allowed to go. Right before that, a big fat Sheik with a long beard came in and look down his nose and said something in Arabic at us. The driver to our van had been changed to a man we knew from the hotel, and we said we wanted to go to the rescue ship now; he said this van is going back to the hotel; we argued with him but he pulled us aside and said: "What you did not understand that Sheik say was: 'When they go to the rescue ship, kill them, chop them up and burn the bodies and blame in on Ghaddafi.' We decided to go back to the hotel. We had to pay all of our last money to the mercenaries so that they would let us go; they were paid $2500 for each person they killed and $1000 to burn the bodies. That took all of our money. We knew that we were on their list and we knew why: a US attorney, double-spy working for Hezbollah, had put all of our names on a list and sent it to them. The next miracle was a friend of the sister of the President of Mauritania. The friend was in charge of the IOM (Immigration) ship. They were able to sneak us onto that ship to Benghazi the next day. That saved our lives: we know that the Al Qaeda mercenaries were looking for us so that they could get paid again. The ship ride was the ride from hell. It took two days in massive heat, no A/C, windows all around the seated area, no food (except hot water, moldy bread and outdated juice cartons that caused everyone to use the bathroom). There were probably 300 to 400 refugees on the ship and there was two bathrooms. Our friend from the IOM took charge of us in Benghazi and took us to a hotel. Lucky for us the list with our names had not reached Benghazi because the communications were down. One of the heads of the rebels came to the hotel because he heard we were there. He was impressed that we had a Baharani Prince with us and so he bought us dinner (we had not eaten for four days). He was able to put us a plane out of Benghazi (even though the rest of Libya was under a no-fly zone). We walked out on a pitch-black tarmac and boarded a raggedy 727 that took off on a black tarmac. We flew low over to Tunis and landed at about 4:30. The story was really just beginning, but at least we were somewhat free of the Al Qaeda rebels. After we arrived back in Texas, Jimmy was taken by the FBI at the Houston Airport passport check center. I was allowed to pass through, and I was the one with the 200 GB of proof: interviews, videos, photos, testimonies, etc. He was interrogated for three hours. We were to learn at a later time that we were targeted by our government at that time. Our crime was that we were witnesses to the war crimes and genocides that were committed in Libya by the NATO gang. As targeted individuals, all attempts to obtain gainful employment or restart our business that was blown up in Libya have been thwarted. After NATO handed Libya over to Al Qaeda, many Libyans were imprisoned, tortured and killed. Many of them left so that they could survive. There are now two million in exile. We are very close to the Tribes of Libya; we speak with the tribal leaders in exile now almost every day. They have appointed us as their official spokespersons. We have been attempting to make it known to our Congress that they were completely wrong footed in Libya and that we basically had handed Libya, a peaceful Muslim country, over to Al Qaeda. No one was interested. The tribal leaders began to pass intelligence regarding the internal movement of Al Qaeda inside Libya; we started passing this information to Dr. Jerome Corsi, who was more than willing to report the truth. We were then contacted by US intelligence (four different divisions). We have had three different divisions of the US intelligence in our home, getting intelligence from our tribal leaders. But we have discovered that they have no intention of doing anything with the information. Instead, the intel was being used to warn Al Qaeda, not stop it, so we stopped passing the information. One of the intelligence people was a lady: she called us after she left and told us that if we ever wanted a life we needed to shut up about Libya and that they (the government) had done a "soft" attack on us (ruined our life and finances) and that we were lucky because they could have chosen to do a "terminal" attack on us. We have been literally destroyed, but we have decided to open our mouths and not shut them. We realize the only way to protect ourselves is by getting our story out to the most people possible. We will be homeless next month as we have no more assets to sell and cannot pay our expenses. We are hoping to start giving presentations and sharing our story with paid honorariums. In that process, we will hope to find good people who might like to hire two very productive, intelligent and talented people. But, we will not stop telling our story. 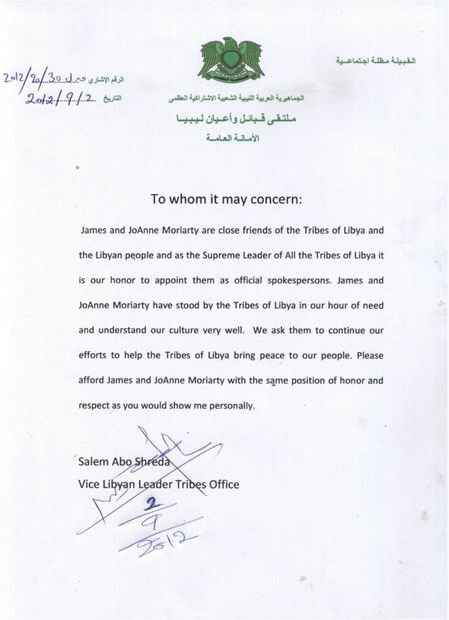 For the full story about what happened to the Moriartys - and Gaddafi's Libya - check out their fascinating (and disturbing) interview on SOTT Radio.